A week before it opened its doors for business, tables with big umbrellas were lined up on Lincoln Road in front of La Cerveceria de Barrio. “I hope they fill them up,” Stewart commented, referring to the quirky and unpredictable nature of the restaurant business. Well, we went to the high energy opening of this Mexican Seafood Cantina and it was packed. Its reputation preceded it! La Cerveceria de Barrio is not your typical Tex-Mex restaurant. Here, the food is authentic Mexican-style seafood. Fresh, made from scratch, Shrimp Stew, Swordfish Empanadas, Octopus Tacos, Tuna Loin Burgers, Blue Crab Tostadas, to name just a few of the unique combinations on their extensive menu. They also serve assorted Margaritas, Cocktails and Beers, all made with fresh ingredients. We couldn’t wait to have another taste of this incredible food, so we went back. And the food was delicious. As part of the VE Restaurant Group, La Cerveceria de Barrio is efficiently operated by Chef Alex Martinez and YES … the tables are consistently filled. In a short time this restaurant has become a “Foodie’s” destination. 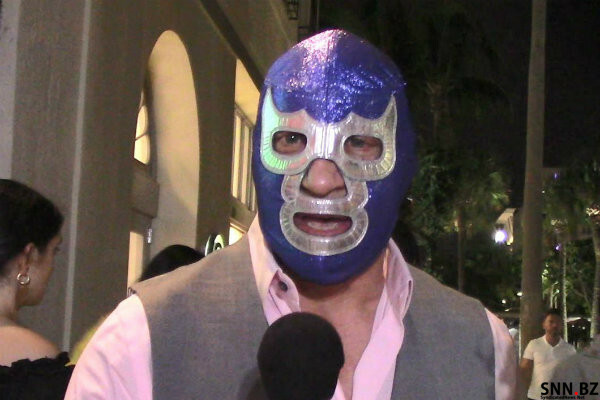 Now, back to the opening party where we ran into the Blue Demon, Jr., World Champion Wrestler in Mexico – who never shows his face! Miami Swim Week – always fun to see tall, lanky, gorgeous swimsuit models strut the runway in as little as they can get away with. Oh, to be young again!!! And tall, lanky and gorgeous!!! Oh my gosh! As a child, Trina Robbins dreamed of being a bohemian – and she pretty much lived her dream. At the Miami Book Fair to promote her recent autobiography “Last Girl Standing”, Trina talked about her life as a cartoonist. Established as an American comics artist, writer and “herstorian”, Trina was an early and influential participant in the underground comix movement. Not able to join the “closed boy’s club”, as she called the underground Comix scene, along with several other like-minded women cartoonists Trina created ‘It Ain’t Me, Babe’, the first underground comic written and drawn solely by women. She was also one of the founders of the first on-going all-woman Wimmen’s Comix. And she produced several editions of ‘Wonder Woman’ for DC. Add to that, Trina has the distinction of being the “Trina” in Joni Mitchell’s “Ladies of the Canyon”. Every year British men and woman, and some outsiders, gather together at the Eden Roc Hotel, to eat, drink, and speak British.